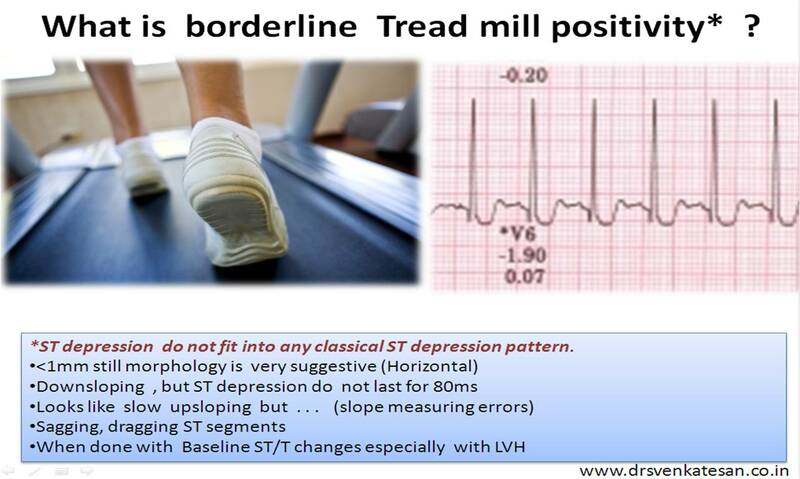 Is there an entity called borderline positive exercise stress test ? In this politically and scientifically uncertain world nothing is in black and white. How can you expect EST to behave differently ? Even as we are fully aware of the limitations of EST , it does not make sense to categorize EST result into either positive or negative . In fact , our estimate suggests a significant bulk of the patient would fall in the grey zone . It is referred in various terms by the reporters of EST . What does all these terms mean to the patient ? It mans only one thing . . . Physician who reports the EST is unable to conclude whether his patient has significant CAD or not . It is a dignified way of expressing the limitations . Lesion factors: Collateralised CAD, treated CAD can result in partial or mild changes. Error in measurement of ST segment . What is borderline for one doctor may indeed be true positive for the other and vice versa . How will be the EST in a revascularised or medically treated CAD ? If revascularization is a complete success , stress test would revert back to normal or it can be a borderline as we have just mentioned. How to proceed after this borderline EST/TMT ? Talk with the patient again , assess the baseline risk of CAD if it is low ignore the TMT result and reassure. Repeat stress test after a month. There is indeed an entity called borderline EST . Do not dare to ignore it or else face the consequences . Read related articles in this site . 1.Can medical management convert EST positive to negative ? 2. Should every one with positive EST should undergo CAG ? How to rule out critical left main or proximal LAD disease with near 100% specificity without coronary angiogram ? Very often in clinical practice cardiologists are asked to R/O significant coronary artery disease in asymptomatic persons .This population includes people with multiple risk factors like diabetes, HT dyslipidemia and non specific ST/T changes in ECG. 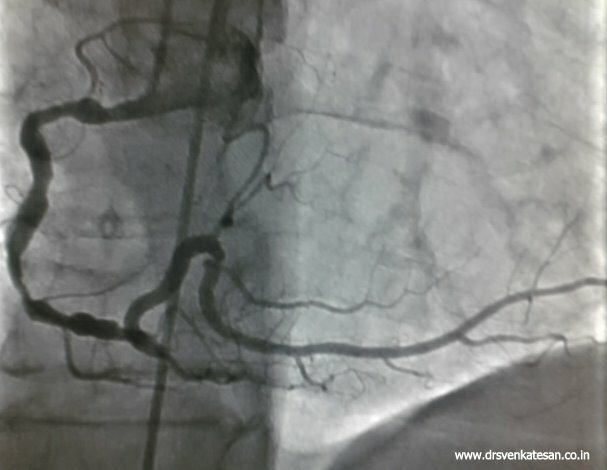 Many of us have lost the confidence of ruling out CAD in these population without looking at their coronary angiogram. Is it a right way of practicing cardiology ? What we need to realise is, we are asked to rule out any critical lesions that are going to make a impact on these other wise comfortable patients. Nothing wrong if you miss a 30% lesion in PDA or OMs or diagonals ! Can we do this without doing coronary angiogram ? Yes , we can . If yes , give a certificate that he has no critical left main or proximal LAD disease. give the above certificate “with a frame” now . For still suspicious physicians , We have one more investigation called echocardiography ! Echo : The forgotten tool for screening left main lesion. In short axis view just tilt at the level of pulmonary valves (Atrio- pulmonary sulcus) one can visualise the left main ostium and the proximal left main emerging from the 4 o clock position. If you are lucky you can see the entire left main. By the way , how can one be happy by ruling out only left main disease ? Is it not other lesions possible ? Experience (Not science) has taught us no critical coronary obstruction is possible , if a patient walks for 9 minutes in treadmill (10METS). Even if it is there (A remote chance) there is little documented benefit of any revascularisation procedure. Is it not a “crazy idea“ to rely on patients history in ruling out CAD in these era , where angiograms relayed live into cardiologists ipad ? Science has no value if it is not applied for the patients welfare. Meticulous clinical examination (And application of mind) is the foundation stone on which any medical investigation and therapy should be based upon. Most of the inappropriate coronary revascularisation are due to neglect of this vital component of clinical examination. Clinical interrogation may miss an insignificant CAD , but it can never miss a critical CAD* . 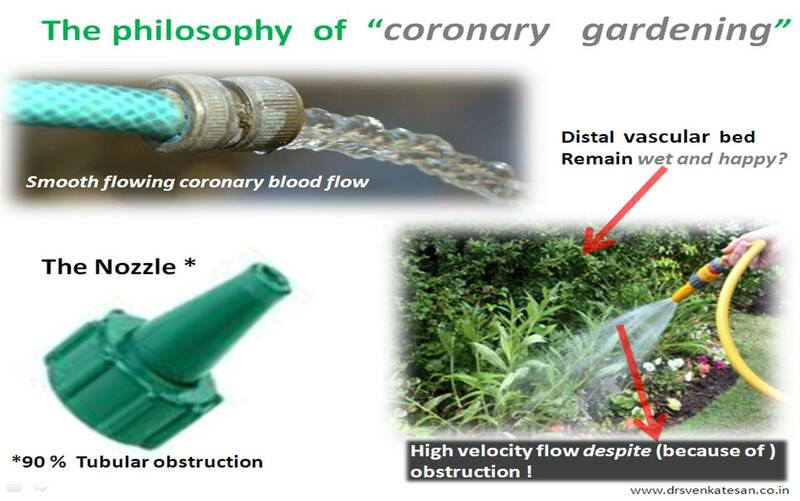 Do not do coronary angiogram routinely to R/O CAD. 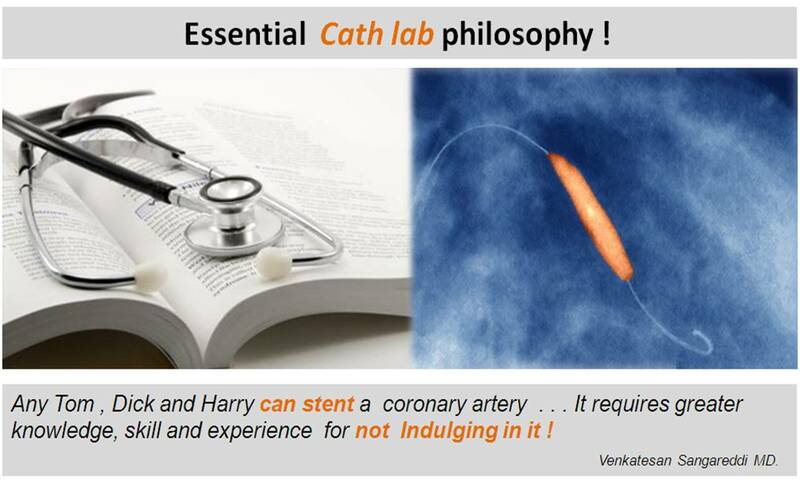 It is not the way cardiology is to be practiced ! If only we apply those simple, time tested concepts in every day practice we not only save millions of Rupees , but also thousands of futile diagnostic tests and associated untoward effects can be avoided. * Senstivity of ruling out any CAD is about 70% , but it’s capcity to R/O critical CAD approaches 100%. Please refer your own Brain. A defiant LAD refuses to die even after hanging ! Thousands of coronary angiograms are done every day. 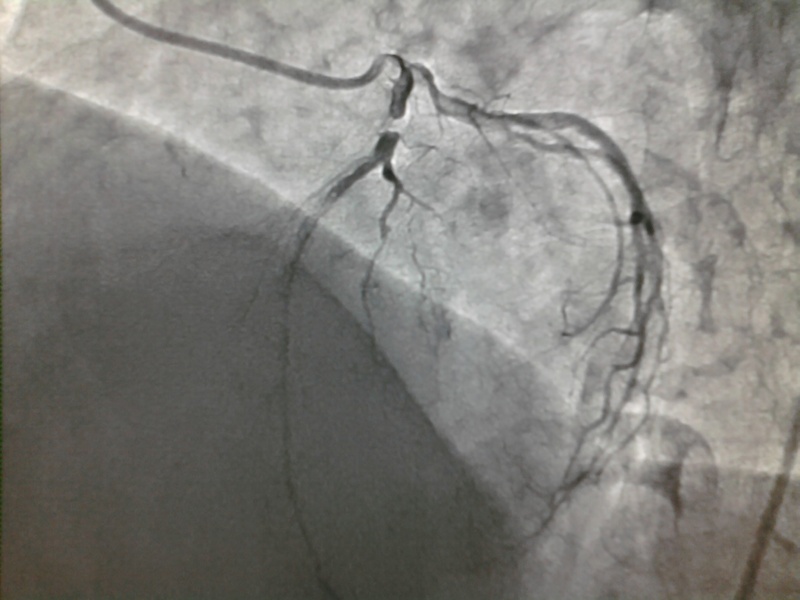 Cardiologist no longer get excited to see exotic coronary lesions .Still , some images can be striking and dramatic. 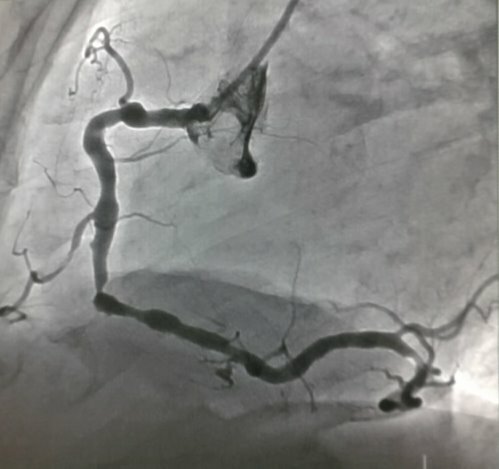 Here is an angiogram from a middle aged man with stable angina , who was one among the routine early morning diagnostic studies in our cath lab. Who chopped the neck of this LAD ? Are you sure there is antegrade flow ? Do you get any clue ? Can a trickle of ante grade flow sustain a TIMI 3 FLOW ? Or is it a very efficient instant collaterals from LCX ? Yes . The first one is right . An almost invisible antegrade channel doing a exemplary job ! Realize an important fact . The distal flow beyond an obstruction is not primarily dependent on degree of obstruction but the status of the distal vascular bed . If it is normal even a hair-line patency can profusely perfuse the distal myocardial segment. 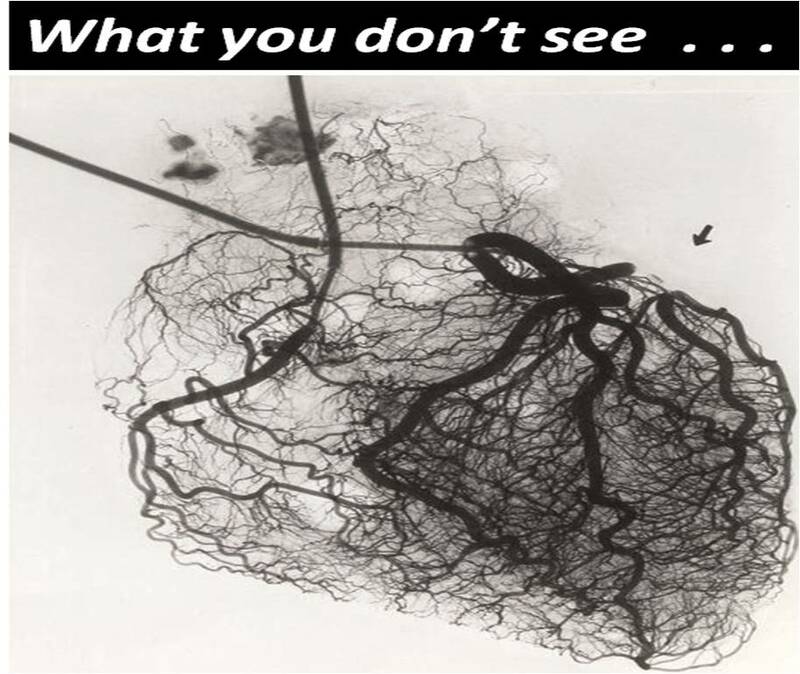 This is what is happening to this man with a stable angina and perfectly normal micro vascular bed. Do not get fooled by the lay man’s logic. Realise there is no simple relation between the degree of obstruction and degree of blood flow impediment.It can be linear , curvilinear , or even inverse depending upon the evolution and timing of obstruction , number of lesions , presence or absence of collateral support , finally and most importantly the integrity of microvascular bed . **Note further : This hemodynamic principle may not apply in acute occlusion as in STEMI , where acute obstruction often has a linear relationship with the quantum of blood flow. By the way what happened to the above patient ? What is your take . Is it a going to be tough cross ? I feel so , but my colleague Dr Gnanavelu strongly differs ! Let me post our experience during PCI shortly. The mystery called post stenotic dilatation ! Newtons third law of motion says for every action there is an equal and opposite reaction . In vascular hemodynamics whenever there is a an obstruction , there tend to be a dilatation of the same blood vessel somewhere distally. It may not be linked to newtons law but it is observed in many .It is more common in large vessels than small ones. Here is a patient with a tight LAD lesion with a significantly dilated segment located immediately beyond the obstruction.This can be considered as a post stenotic dilatation. Coronary ectasia is also a possibility but since it is related to site of obstruction the former is likely . What determines the post stenotic dilatation ? Is there a anatomical defect in post stenotic dilatation ? Not every one goes for post stenotic dilatation.There is a possibility it occurs only in genetically susceptible individuals . 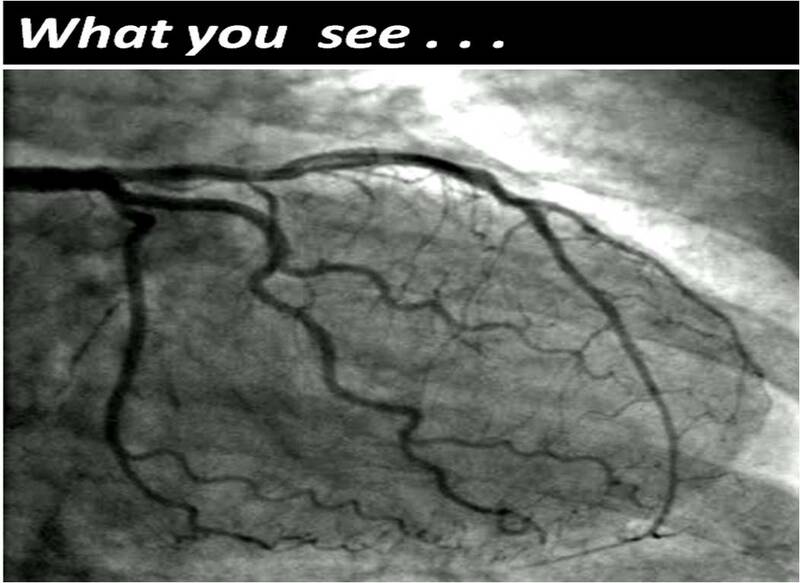 The post stenotic segment has a potential to misbehave in the period following PCI . If the distal instent stenosis occur (even if it is minor ! ) it can induce a cycle of post stenotic eversion of normal segment and risk of edge effect or stent thrombosis is more.